What is all the big fuss about high cholesterol? The big concern: Excess cholesterol in the blood is a major risk factor for heart attack and stroke in America. If this is you: LDL cholesterol is above 3.36, HDL is less than 1.16, and your Total Cholesterol to HDL ratio is over 4.4 mmol/L, you need to urgently bring down these numbers. You are in control. Do not wait for symptoms to appear. In 50 percent of deaths from a heart attack, sudden death was the very first symptom. We have the knowledge to prevent a tremendous amount of death, disability and suffering right now if we are wise enough to apply it. Visit the cardiac ward of any hospital and you will understand what I mean. 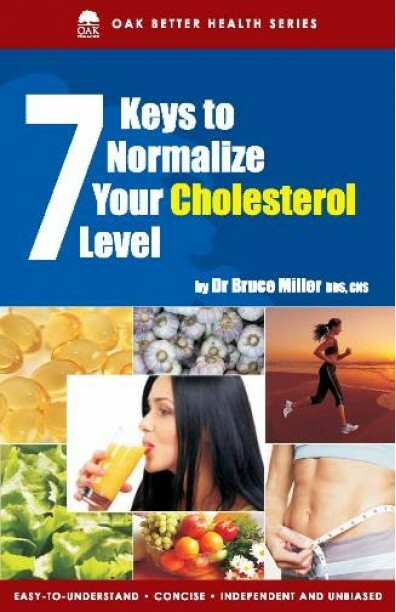 In this book, you will discover seven keys in simple and concise language to help lower your cholesterol to a healthy level. ABOUT THE AUTHOR Dr. Bruce Miller’s postgraduate studies at New York University included clinical, nutrition oriented research which focused on nutrition problems of the elderly. Dr. Miller is a member of the Linus Pauling Institute of Science Medicine, a charter member of Dr. Kenneth Cooper’s Aerobics Center, a member of the International Academy of Preventive Medicine, International College of Applied Nutrition, founder of the Diet Analysis Centre, and a consultant to the American Running and Fitness Association. Dr. Miller is a Certified Nutrition Specialist and a member of the American College of Nutrition. Currently Dr. Miller is the Director of Research for the American Academy of Nutrition. Dr. Miller lives in Dallas with Jody, his wife of more than 40 years.